Pulmonary fibrosis (PF) is defined as a gradual, interstitial fibrous disease of the lung parenchyma. PF causes collapse of the lung lobe, which can lead to lung lobe torsion of the other side. A 14-year-old male Pekinese dog was referred to the Veterinary Medical Center, Chungbuk National University. The chief complaint was acute dyspnea. The dog had a history of chronic cough, which lasted for 18 months, and the cough had recently deteriorated. Tachypnea was observed on physical examination. As a result of thoracic radiographs, ultrasonography, and computed tomography, lung lobe torsion and collapse were diagnosed. A postmortem examination revealed lung lobe torsion of the left cranial lobe and carnification of the right cranial lobe. 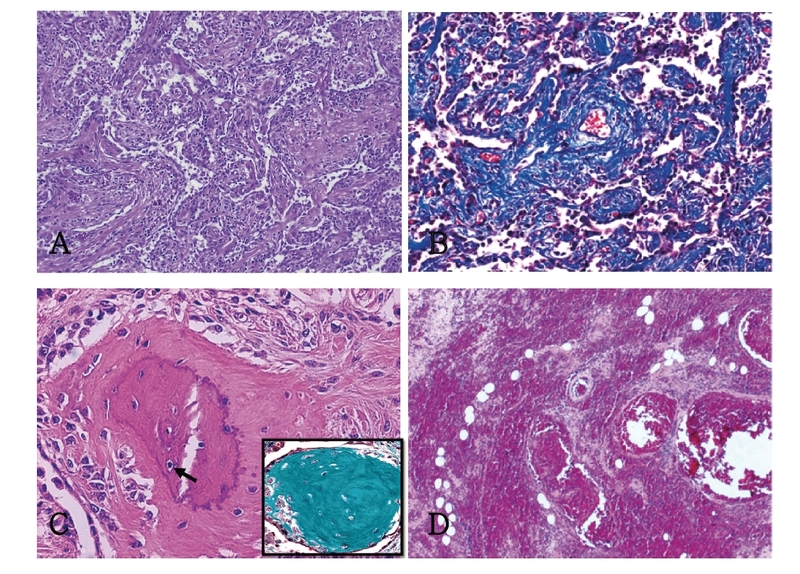 Histologically, severe and diffuse interstitial fibrosis with distortion of alveolar architecture and severe congestion and/or hemorrhage were observed in the right cranial lobe and left cranial lobe, respectively. Although the cause of pulmonary fibrosis was undetermined, this case showed a typical lung lobe torsion caused by pulmonary fibrosis. 폐섬유증은 만성적으로 폐 실질에 섬유조직이 점진적으로 침착되는 질환으로 보통 섬유화가 진행되는 동안 증상이 잘 나타나지 않기 때문에 이 질환의 발견이 늦고 그로 인해 예후가 좋지 않다. 개에서 폐섬유증의 발생 정도, 원인, 병인론은 알려진 바가 적다. 폐섬유증은 나이가 많은 개에서 발생하며, 다른 종에서도 발생하지만 특히 West highland white terrier 에서 자주 발생한다. 최근에는 Jack Russell terrier, Staffordshire bull terrier, Cairn terrier를 포함한 다른 terrier 종에서 폐섬유증의 발병이 보고되어 왔다[2, 3]. 폐섬유증이 심화되어 폐허탈이 동반되는 경우 가스 교환이 제대로 이루어지지 않아 호흡곤란, 빈호흡, 운동 불내성의 증상이 나타나고 만성적인 기침과 청진 시 흡기성 수포음, 말기에는 청색증이 나타난다. 폐섬유증의 원인으로는 감염, 독성물질에의 노출, 약물반응, 먼지, 결합조직질환 등이 있고 알려지지 않은 원인에 의한 섬유증을 특발성 폐섬유증이라고 한다[3, 4]. 어떠한 원인에 의해 꽈리와 내피세포들이 손상되면 염증세포들이 폐로 이동하고 이들은 손상된 조직을 회복시키기 위해 싸이토카인을 분비하는데 이러한 싸이토카인들은 섬유조직을 증식시킨다. 싸이토카인의 한 가지 예로 transforming growth factor (TGF)-β은 조직 수복과정에서 발현이 증가하여 콜라겐 유전자의 전사를 자극하고 섬유모세포가 콜라겐을 생성하도록 한다. 이로 인해 섬유모세포를 포함한 섬유소 삼출물이 꽈리로 이동한다. 만성적인 자극이 있을 시에는 이러한 기전에 의해 섬유조직의 증식이 과도하게 일어나 폐의 간질조직과 꽈리 내강에 콜라겐이 과도하게 축적되어 폐허탈이 일어나 호흡을 어렵게 한다. 폐섬유증을 진단하기 위해서는 조직소견을 봐야 하지만 사람에서는 특발성 폐섬유증을 진단하는데 컴퓨터 단층촬영이 유용하게 쓰이고 있고 앞으로 개에서도 특발성 폐섬유증을 진단하고 질병의 단계를 모니터링하는 비수술적인 진단도구로써 컴퓨터 단층촬영이 유용하게 쓰일 가능성이 있다. 폐염전은 폐엽이 꼬이는 질환으로 폐염전 발생 시 폐동맥, 폐정맥, 기관지가 폐색되어 염전된 폐로 가는 혈액과 공기의 흐름이 차단된다. 폐염전은 생명을 위협하는 질환으로 깊고 좁은 흉강을 갖는 Afghan hounds같은 대형견종에서 발생하고 Pugs를 제외한 소형견종, Toy breed dog에서는 드물게 발생한다[7, 8]. 폐염전이 잘 발생하는 부위는 좌측 폐전엽과 우측 폐중간엽인데 우측 폐중간엽의 경우 폐엽 자체가 좁고 종격동, 흉벽, 우측 폐전엽, 우측 폐후엽과의 부착 정도가 적어 움직임이 쉽다. 폐섬유증과 폐염전이 잘 발병하지 않는 페키니즈 종에서 두 증상이 모두 나타난 이 증례는 임상적으로 의미가 있으며 이 증상에 따른 부검소견과 조직소견을 통해 폐섬유증과 폐염전의 연관성을 알아보았다. 14년령의 수컷 페키니즈가 급성 호흡곤란 증상으로 내원하였다. 증등도 이상의 호흡곤란이었으며, 전혀 움직이려 하지 않았고 식욕이 거의 없었다. 1년 반 전부터 만성적인 기침이 있었으며 최근 1주일 간 기침이 심해졌다. 기생충예방을 꾸준히 하였고 심장사상충검사에서 음성이었다. 신체검사상에서 우측보다 좌측 흉벽에서 심음이 미약하게 청진되며 우측에 grade 1~2정도의 심장잡음이 청진되었고 빈호흡, 5% 탈수 소견이 있었다. 혈액학적 검사로 증가된 백혈구와 감소된 적혈구가 보였고, 흉수 검사 결과로는 출혈성 흉수로 진단되었다. 방사선 소견으로 흉부에서 좌측 전엽은 연부조직음영이 균질 하게 증가하였고, 가스음영에 의한 vesicular sign이 관찰되었다. 복배상과 배복상에서 심장은 우측으로 변위 되었고 우측폐 중엽과 후엽 사이에서 interlobar fissure가 관찰되었다. 초음파 소견으로는 trapped air가 폐실질 내에서 관찰되며 액체로 찬 기관지가 관찰되었다. 도플러 검사 시 폐실질의 혈류흐름은 관찰되지 않았다. 우심실의 내강은 좌심실의 2배 정도로 확장되어 보였고 우심방도 좌심방에 비해 확장되어 보였다. 도플러 혈류 측정 시 우심실에서 우심방으로의 혈류 흐름이 관찰되었으나 삼첨판은 정상적인 형태로 관찰되었다. 컴퓨터 단층촬영소견으로 좌측 전엽으로의 폐동맥 주행은 관찰되나 기관지와 폐정맥 주행은 관찰되지 않았으며 연부조직 음영의 좌측 전엽은 정상보다 부피가 더 증가해 보였다. 우측 전엽과 중엽은 허탈되어 실질의 연부조직 음영의 증가가 관찰되나 기관지와 폐혈관은 연속성을 가지며 주행했다. 영상학적으로 좌측폐 전엽의 염전과 우측 폐의 허탈이 진단되었고 내원 24시간 경과 후에 호흡곤란으로 사망하였다. 좌측 폐염전의 육안 소견과 우측 폐의 허탈소견 확인 및 급성 호흡곤란을 유발한 원인을 확인하기 위해 조직병리학적 검사를 실시하였다. 조직검사를 실시하기 위해 환자의 조직을 10% 중성 포르말린에 고정하고 일반적인 조직처리 과정을 거친 후 파라핀에 포매하였다. 포매된 조직을 4 μm 두께로 박절하고 hematoxylin & eosin 염색(H&E)으로 염색 후 DP70 (Olympus, Japan) 카메라가 탑재된 AX-70 현미경(Olympus, Japan)으로 조직을 관찰하였다. 폐섬유증을 확진하기 위하여 Masson’s trichrome 염색을 하였고, 폐섬유증이 있는 폐에서 뼈의 화생이 의심되어 Goldner’s trichrome 염색을 하였다. 복강 내에는 포도주색조의 혼탁한 수양성 내용물이 다량 차 있었으며 장절간에는 실 같은 끈끈한 내용물이 붙어 있었다. 흉강내에는 담적색조의 혼탁한 수양성 내용물이 다량 차 있었다. 우측 전엽은 미만성으로 백색조를 띠고 경도가 다소 단단하며 주변 모서리가 둔하게 관찰되었다(Fig. 1). 좌측폐 전엽은 반시계 방향으로 180도 염전되어 있었고, 미만성으로 심하게 종대되어 암적색조를 띠고 있었다(Fig. 1). 좌측 후엽과 우측 중간엽, 후엽은 퇴축되어 미만성으로 연한 적색조를 띠며 표면은 다소 창백했다. 폐의 각 엽에 미만성으로 직경 1 mm 이내의 백색반점이 산재하고 있었다. 기관점막 내에는 미만성으로 선홍색조의 수양성 내용물이 후두개부터 표면을 덮을 정도로 소량 저류되어 있었다. 경미한 우심비대가 보이고, 간은 미만성으로 암색조를 띠며 다소 얼룩진 무늬를 나타냈다. 신장피막의 박리는 수월하지 않았다. Fig. 1. Gross lesion of lung lobes. Note the severely enlarged and congested left cranial lobe with 180◦ torsion (white asterisk), carnified right cranial lobe (black asterisk) and normal lobe (arrow). 우측폐 전엽은 폐간질조직에 섬유결합조직의 증식으로 꽈리벽이 심하게 비후되었고, 이로 인해 꽈리 내강은 매우 협소하였다(Fig. 2A). 이를 Masson’s trichrome 염색을 통해 확인한 결과 폐실질에 미만성으로 푸르게 염색된 섬유조직이 미만성으로 증식하고 있는 모습이 확인되었다(Fig. 2B). 꽈리 내강에는 꽈리콘포식세포, 호중구, 호산구, 형질세포 등의 염증세포가 침윤되어 있었고, 2형 꽈리세포의 과형성이 관찰되었다(Fig. 2A). H&E 상에서 폐실질 곳곳에 lacuna 구조를 가지고 세포질은 호산성을 강하게 띠는 뼈조직의 형성이 의심되어 Goldner’s trichrome 염색을 통해 명확히 확인할 수 있었다(Fig. 2C). 염전된 좌측폐 전엽에서는 미만성의 심한 울혈, 출혈로 인하여 정상 폐조직의 형태를 알아보기 어려웠다(Fig. 2D). 심장은 울혈소견과 심근비대, 간질 섬유화가 보였고, 간과 신장도 울혈소견을 보였으며 이로 인한 세포 손상이 관찰되었다. Fig. 2. Histologic pulmonary lesions. A, Diffuse severely thickened alveolar walls with atelectasis (H&E, ×100). B, Severely proliferated fibrous tissues (blue) in pulmonary parenchyma (Masson’s trichrome stain, ×100). C, Osseous metaplasia in pulmonary parenchyma (H&E, ×200). Note the osteocytes in lacuna (arrow) and positive staining of osseous tissue in rectangle (Goldner’s trichrome stain, ×200). D, Diffuse severe congestion and hemorrhage in parenchyma of right cranial lobe (H&E, ×100). 본 증례의 환자는 급성호흡곤란으로 사망하였으며 진단영상학적 검사로 좌측 폐 전엽의 폐염전으로 진단되었지만 우측폐 전엽은 심한 허탈소견이 발견되었고 이로 인한 폐고혈압에 의한 폐심장증이 의심되었다. 조직학적 소견에서 우측폐 전엽은 폐 간질조직과 꽈리내강에 꽈리콘포식세포, 호중구, 호산구, 형질세포 등의 염증세포가 침윤되어 있었다. 염증세포의 침윤은 폐섬유화의 원인에 의해 활성화된 꽈리콘포식세포가 분비하는 화학주성인자에 의하는데 이러한 염증세포는 단백질분해효소, 라디칼을 분비하여 꽈리벽을 구성하는 1형 꽈리 세포와 기저막을 손상시킨다[9, 10]. 이로 인해 보상적으로 2형 꽈리 세포의 과형성이 발생하고 염증세포가 분비하는 싸이토카인에 의해 섬유모세포가 폐 손상부위로 이동하여 조직을 회복시키기 위해 콜라겐과 기질 단백질을 생산한다. 이 증례의 경우 섬유화의 원인이 치료되지 않고 계속적으로 꽈리콘포식세포를 활성화시켜 폐 간질조직에 콜라겐의 생성이 과도하게 나타난 것으로 보이고, 이로 인해 꽈리벽이 확장되어 꽈리 내강을 거의 확인할 수 없었다. 이러한 만성적인 자극이 있을 경우 화생이 발생하는데 이 환자에서는 폐 실질 곳곳에 뼈의 화생과 평활근 증식이 관찰되었다. 이 환자의 임상증상과 조직학적 소견으로 미루어 보아 우측폐 전엽의 폐섬유화는 만성적으로 진행된 것으로 생각된다. 염전된 좌측폐 전엽은 폐엽으로 주행하는 폐동맥과 폐정맥이 폐쇄되어 육안소견에서 미만성으로 암적색조를 띄며 심하게 종대되어 있었고 조직 소견에서 꽈리 내강과 간질조직이 적혈구로 가득 차 있었다. 폐염전을 일으키는 원인으로는 다른 폐엽의 허탈, 외상, 흉강 질병, 흉부 혹은 복부의 수술병력, 만성적인 기관지염, 특발성 폐염전이 있는데 위와 같은 원인들은 폐엽의 무기폐화를 야기하여 다른 폐엽의 움직임을 수월하게 한다[8, 14]. 이 환자의 경우 외상이나 흉부, 복부의 수술병력이 없었고 페키니즈종에서 폐염전이 매우 드물게 발생한다는 점으로 미루어보아 우측 폐 전엽의 폐섬유증이 좌측 폐 전엽의 폐염전을 야기했을 가능성이 크다. 또한 조직 소견상에서 심근변성과 간질 섬유화가 보였고 간과 신장에서 울혈로 인한 세포손상이 관찰된 것으로 보아 폐섬유증과 폐염전에 의한 폐심장증의 가능성이 높아 보이고, 이로 인한 전신 순환 부전으로 흉, 복수가 생성된 것으로 사료된다. 페키니즈종은 좁은 흉강 구조로 인해 폐염전이 매우 드물게 발생하는데 이 환자는 만성적인 폐섬유화에 의해 폐염전이 발생했으며 이로 인한 폐심장증으로 전신장기의 부전이 유발된 것으로 생각된다. 이 논문은 2010년도 충북대학교 교내연구비 지원에 의하여 수행되었습니다. 1.Heikkila HP, Lappalainen AK, Day MJ, Clercx C, Rajamaki MM. Clinical, bronchoscopic, histopathologic, diagnostic imaging, and arterial oxygenation findings in West Highland White Terriers with idiopathic pulmonary fibrosis. J Vet Intern Med 2011;25:433-439. 2.Corcoran BM, Cobb M, Martin MW, Dukes-McEwan J, French A, Fuentes VL, Boswood A, Rhind S. Chronic pulmonary disease in West Highland white terriers. Vet Rec 1999;144:611-616. 3.Corcoran BM, Dukes-McEwan J, Rhind S, French A. Idiopathic pulmonary fibrosis in a Staffordshire bull terrier with hypothyroidism. J Small Anim Pract 1999;40:185-188. 4.Lobetti RG, Milner R, Lane E. Chronic idiopathic pulmonary fibrosis in five dogs. J Am Anim Hosp Assoc 2001;37:119-127. 5.Dungworth DL. Interstitial pulmonary disease. Adv Vet Sci Comp Med 1982;26:173-200. 6.Ryu JH, Colby TV, Hartman TE. Idiopathic pulmonary fibrosis: current concepts. Mayo Clin Proc 1998;73:1085-1101. 7.Wells AU, Hansell DM, Rubens MB, Cullinan P, Black CM, du Bois RM. The predictive value of appearances on thin-section computed tomography in fibrosing alveolitis. Am Rev Respir Dis 1993;148:1076-1082. 8.Johnson VS, Corcoran BM, Wotton PR, Schwarz T, Sullivan M. Thoracic high-resolution computed tomographic findings in dogs with canine idiopathic pulmonary fibrosis. J Small Anim Pract 2005;46:381-388. 9.Neath PJ, Brockman DJ, King LG. Lung lobe torsion in dogs: 22 cases (1981-1999). J Am Vet Med Assoc 2000;217:1041-1044. 10.White RN, Corzo-Menendez N. Concurrent torsion of the right cranial and right middle lung lobes in a whippet. J Small Anim Pract 2000;41:562-565. 11.Rooney MB, Lanz O, Monnet E. Spontaneous lung lobe torsion in two pugs. J Am Anim Hosp Assoc 2001;37:128-130. 12.Murphy KA, Brisson BA. Evaluation of lung lobe torsion in Pugs: 7 cases (1991-2004). J Am Vet Med Assoc 2006;228:86-90. 13.Ward PA, Hunninghake GW. Lung inflammation and fibrosis. Am J Respir Crit Care Med 1998;157:S123-S129. 14.Brody AR, Soler P, Basset F, Haschek WM, Witschi H. Epithelial-mesenchymal associations of cells in human pulmonary fibrosis and in BHT-oxygen-induced fibrosis in mice. Exp Lung Res 1981;2:207-220.